Engaging biography of the Scottish scientist (and, in his day, renowned eccentric) who braved the “fire of damnation” by suggesting that the Book of Genesis was a metaphor, not a documentary. 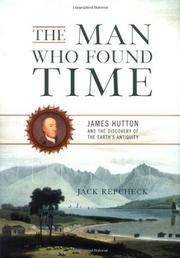 Repcheck, a science editor at Norton, reckons that James Hutton is something of an obscure figure today for several reasons: he lacked Charles Darwin’s genius for self-promotion, announced his greatest hypotheses at a time when the English-speaking world’s attention was fixed on the American Revolution, and, plainly put, “was not a gifted communicator.” Moreover, his massive magnum opus, The Theory of the Earth, was a jumble of mathematical formulas and learned quotations in many languages, hard to slog through and in any event printed in an edition of only 500 copies. Yet, as Repcheck ably shows, Hutton’s work was profoundly influential. He presented formal proof, for the first time, that the world was far older than the 6,000 years the Bible allowed—a chronology, Repcheck writes, that was held to be sacred and irrefutable, for which reason Hutton was widely denounced as a heretic, even though he, like Copernicus (but unlike Darwin), “had strong faith in God.” Furthermore, Hutton recognized that the Earth’s form required long periods of time by which cyclical processes such as volcanism and erosion could do their work—an idea that was of transformational importance to the new science of geology. “For Hutton,” Repcheck writes, “there was no need to call upon unseen and unknowable catastrophes from the past, such as the Deluge or the Universal Ocean, to explain any geological formations; they were all understandable based on knowledge and processes still occurring.” In other words, on evolution—and Repcheck does a fine job of showing how Hutton’s ideas paved the way for those of Lyell and Darwin, whose iconoclastic theories would soon overshadow his own. A welcome contribution to the history of science, one that merits shelving alongside Stephen Jay Gould and John McPhee.